Who are the participants? Please introduce them. The consortium has 6 partners: three universities and three industry oriented companies. The partners are from Malta, Poland, Great Britain and Germany. EASA is an informal partner supporting certification and permission issues. With the recently introduced new amphibian airplane S´ray 007 (two seater), the aviation department was given an own legal body (Dornier Aviation GmbH) under the umbrella of the Dornier Technology GmbH & Co KG. is the first all seaplane airline to be granted an Air Operators Licence in Malta. 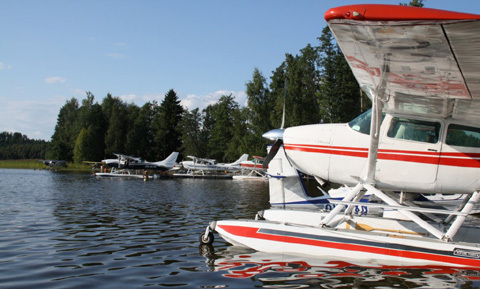 The company is backed by Harbour Air (Canada) who besides being the largest seaplane operator in the world has provided the knowledge and expertise that is required to run a successful, efficient and seaplane service. Mr Greg Mcdougall as the CEO of Harbour Air Vancouver is a major shareholder of HAM. Greg brings to the table a wealth of experience with 25 years in the business of seaplanes. Harbour Air in Vancouver will be providing all the technical, maintenance and operational expertise to the Maltese company. The TU Munich is compiled of 12 faculties with 240 academic chairs, more than 240 professors and almost 4,000 staff members and is one of Germany’s most renowned universities for science and engineering. The Institute of Aeronautical Engineering (LLT) with its 13 scientists is covering as an aeronautical systems institute the complex system “air transportation” in education as well as in certain areas of research. In addition to the engineering and development aspects of aircraft, aeronautics is concerned with all facets of safe, economically, and environmentally friendly air traffic and transportation. The five pillars in Research and Education are: Design and Evaluation of Aircraft and Aircraft Systems, Aviation and Environment, Airport Operations, Passenger and Cabin as well as ATM activities. Scenario Analysis Techniques are being developed and applied for strategic research in air transport and aviation. provides technical education since 1951. RUT provides education at 5 faculties: Mechanical Engineering and Aeronautics, Electrical and Computer Engineering, Civil and Environmental Engineering, Chemical Engineering and Management and Marketing (non-engineering). The Faculty of Mechanical Engineering and Aeronautics is the oldest and largest faculty at the Rzeszow University of Technology. Research aeries of the Faculty: aircraft design, jet engines, avionics, aerodynamics, structures and techniques. Main topics within FUSETRA are optimisation of airplanes fleet work, optimum choice of main design parameters of general aviation airplane in preliminary stage design, methods and algorithms of multi – purpose systems optimisation. is the fourth oldest university in the English-speaking world with almost 16,000 undergraduate, 4000 postgraduate students and with over 5000 staff. Aerospace engineering is part of engineering faculty. Proposal related research areas are aircraft aerodynamics design and flight performance, preliminary aircraft design, airworthiness requirements, safety, market requirements and statistics. The design and structures group is specialised in aircraft system design including mission optimization and certification aspects. was founded 2005 after the retirement of Dr. Bernd Sträter, a former CEO of Dornier Luftfahrt GmbH, Eurocolumbus GmbH space station and Zeppelin Luftschifftechnik GmbH & Co KG. He mainly consults enterprises and higher education institutions with activities in aerospace. The consulting activities include strategic orientation, business plans, marketing and event organisation. Based on the experience of today’s seaplane/amphibian operations, its weaknesses and strengths and the opinion of experts of all relevant involved groups (stakeholders) new concepts and requirements for a future seaplane /amphibian traffic system shall be developed. The consortium was chosen to perform the objectives in the best way. For the theoretical studies including the definition of requirements for new market oriented vehicles, seaplane parks and its infrastructure and the integration into the traffic chain sea/land/air researchers were found at the technical universities in Munich (TUM), Rzeszow (RUT) and Glasgow (GU) with its complementary orientation in airplane design (GU), system layout and operation (TUM) and system optimisation (RUT). All of them have a long experience in airplane design and aeronautical traffic system research. Furthermore all involved institutes have co-operations with aeronautical industries and are practical oriented.